I am writing this post primarily to teach my students how I search for potential rocket stocks–stocks that have been launched and appear headed towards new peaks. As I said in class this week, it makes the most sense to buy stocks that have the best fundamentals and technicals. This strategy has been advocated both by Nicolas Darvas and William O’Neil in their extraordinary books (listed at lower right of this blog). Darvas, made a fortune trading in growth stocks in the late 19050’s and said that he liked to buy stocks that were trading at all-time highs and that had already doubled in the past year. So, I am going to show you how I use the great TC2007 stock charting and analysis program to find potential rocket stocks that I research further before buying. I used TC2007 to scan the market for stocks that meet my most stringent fundamental and technical criteria for rockets. These stocks have great fundamentals and technicals, have already doubled their price a year ago and are near 5 year or all-time highs. I have listed in this table the 11 stocks out of 4,000 in my stock universe that met these criteria. All of these stocks had last quarterly earnings up at least 100%. Coincidentally, all but 4 of the 11 are in my records as having appeared on the IBD100 and/or IBD New America lists during the past year. 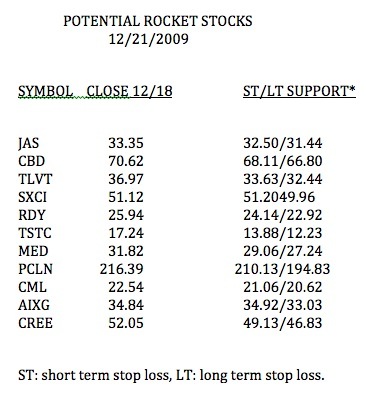 I have also noted in this table where I might place long term or short term stop losses on each long position. The most conservative stop loss is the short term support level. With a growth stock I rarely retain a long position if the stock closes below its short term support level. However, if I bought near long term support I might use the LT support level as my exit strategy. I will return to these 11 stocks in a future post to show you how they behaved. These stocks have already proven themselves as being in strong up-trends, but one never knows when an up-trend will end. That is why I immediately enter a sell stop or buy a put option for insurance, after buying one of these high momentum stocks. I currently own 3 of these stocks. Below is a Guppy Multiple Moving Averages (GMMA) weekly chart (click on chart to enlarge) of one of these rocket stocks, RDY. 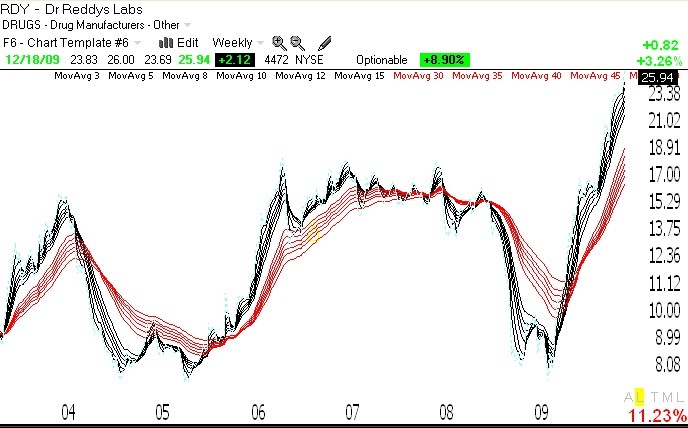 Note how all of the shorter term averages (black lines) are well above the rising long term averages (red lines). This is the type of technical strength I seek in a potential rocket stock. Meanwhile, the GMI and GMI-R remain at their maximum levels. From time to time I attend stock meet-ups and listen to members opine about how useless the IBD 100 lists are. People just like to denigrate things without examining the evidence and these untruths tend to get passed on unchallenged. Each Monday, IBD publishes a list of the top 100 growth stocks that meet their technical and fundamental criteria. I feel a lot more confident buying stocks on this list because IBD’s stock selection criteria are based on analyses of their comprehensive database of the best stocks over the past 100 years. Imagine that–they actually analyzed the characteristics of past market winners to design an empirically based system for selecting winners BEFORE they take off. Because human trading psychology is pretty stable, one can discern lasting technical patterns (which are really trading decisions) that are characteristic of winning stocks. Read moreIBD 100 list top ten stocks do outperform! The market up-trend is in place and I am almost 100% invested on the long side in my trading IRA. I am also largely invested in mutual funds in my university pension. This is the time to ride the train and not to fight it. No one knows when the up-trend will end. The idea is to ride it and have sufficient stop losses in place to exit if the trend should convincingly reverse. The GMI is at 5 of 6, having been at 6 at Thursday’s close. There were less than 100 new highs (74) in my universe of 4,000 stocks on Friday, bringing it down to 5. I suspect we will be back to 6 this week. Meanwhile, 84% of the Nasdaq 100 stocks had their MACD close above its signal line, a nice show of strength. The Worden T2108 Indicator is at 88%, near the top of the range it typically reaches. But it can stay above 80% for months. If calling the short term trend of the market were easy, we would all be rich and retired. Last week, my short term QQQQ indicator gave me a head fake and turned my daily trend count down. That new downtrend lasted for two days and then the up-trend resumed. However, I had indicated at the time that my short and long term QQQQ indicators were giving inconsistent readings, with the long term indicator remaining in an up-trend. The new short term up-trend just completed its 3rd day. The more that I analyze the market, the more I become convinced that I should rely on the longer term weekly trends to determine the market trend (see discussion of the Guppy chart below). The QQQQ has been above its critical 10 week average for 11 weeks and the SPY for 10 weeks. But I have told you that I am a chicken, and would rather go to cash at the first sign of weakness and re-enter the market later, after the dust has cleared. I actually have other, personal reasons, for why I am unwilling to enter the market right now. I cannot trade successfully when I am stressed by other concerns. The only stock I own is ASIA, with a close stop loss.